The twelve photographs are sequenced to follow the narrative of the biblical story. The views of the Dead Sea increase in luminous intensity as the story reaches its climactic description of the destruction of Sodom and Gomorra. 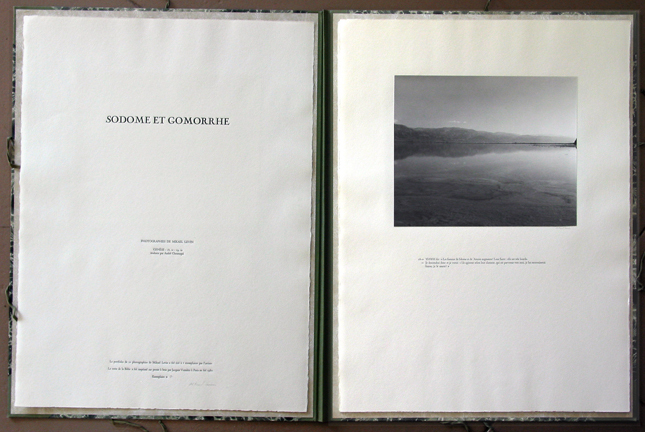 Text in French, set in Monotype, 13 pages. Edition of 5. Portfolio format: 22 x 30 inches. Gelatin Silver prints: 11.5 x 14 inches.